At Academy of Hair Design, we know it’s important to identify your core values and hold them closely to every day interactions. In this series, we will be looking closely at the day to day applications of Fun, Love, Excellence and Transformation. To begin, we’ll identify fun in a working application; that of enthusiasm. How can we implement fun to our daily lives in a way that can be felt? Do you remember the last time you were genuinely excited to wake up on a weekday? Have you ever woke up, looked at your career, and found that you slipped from the path and landed in a place where daily life feels like a preexisting condition to be dealt with? Think about your normal work week. How quickly do you feel the need to decompress? Well, the good news is this: You aren’t alone. A 2017 Gallup Poll reported that a mere 15% of the world’s one billion full-time workers are truly engaged at work. That same study revealed that while employees might not hate their job, they certainly feel the effects of burnout semi-constantly. At Academy of Hair Design, one of our core values is fun. Now, if you’ve ever gone to school, you might wonder why we insist upon building fun into the framework of our educational experience. And you are probably wondering why we’ve tied enthusiasm to this core value. The simple answer is this: living in your passion is a wonderful opportunity that requires a lot of hard work! Fun is fuel for your passion and it is expressed through enthusiasm. Keep reading to see how you can approach education and life with enthusiasm! Steve Irwin may have experienced a different education than beauty and barbering, but he understood something about getting the most out of an education. Having passion instills purpose. This is, of course, the heart behind the phrase “Do what you love, love what you do.” When you come in to receive your education, it does you no favors to dread early class mornings or new level requirements. Approaching each new task with a positive attitude ensures that you will see success in the end. To the best educators, learning does not operate on a black and white canvas, but rather a variety of pictures for the different experiences through which students approach the classroom. It’s important to think about what drives you into training for your future profession. We’re all familiar with the phrase, “Money can’t buy happiness.” In the same vein, if your drive comes from the sole desire to make that money, it will be hard to find satisfaction. One, two-part practical approach to being more enthusiastic is getting more sleep at night and waking up earlier. That way you’re not having to wake up in the classroom and losing steam while you’re firing up. The more mental component is willingness. Decide each day that you will take the most from your experience and you’ll be impressed with the results. The U.S. Department of Labor released a guide for young people on mastering soft skills for success and entering the workforce smoothly. Soft skills, also known as interpersonal skills, are harder to define and even harder for employers to teach. Hard skills are generally things that can be taught on the job or through continuing education and measured in a more definable way. However abstract though, soft skills are indispensable to being a good employee. This guide listed enthusiasm as a valuable soft skill. When searching for a job, an interviewer analyzes those soft skills. A genuinely optimistic approach to questions and presented problems shows that you are passionate and willing. Moreover, it shows that you are dedicated to making an effort for excellence. When you prove you have control over your attitude, it proves to a potential employer that you are dependable. So, you’ve aced the interview, dazzled everyone with your soft skills, and now it is your first day on the job… Where do you go from here? You’re probably wondering what it will take to sustain that beautiful front you put up from the other side of the desk. First, know that Forbes wrote an article discussing some of the content of the popular book by Laura Vanderkam called The 7 Ways Successful People Approach Their Work. The seventh way won’t come as a surprise to you: pursuing pleasure. She doesn’t mean to secretly sneak in a pocket-sized game to play underneath your desk. Successful people across the world make a point to find joy in their day to day. Laura found that the most joy in the workplace doesn’t come with encouragement from the boss, but instead from identifying and finding progress. Fortunately, working in a client-based business gives opportunity to set and focus clearly on goals. The other half of the struggle is simply taking a deep breath and choosing to embrace each workday as a chance to learn, grow, and have a positive impact on those around you. In the last twenty years, the power of positive psychology has been increasingly respected. Christopher Peterson, one of the founders of positive psychology has stated he believes what brings us the most happiness is other people. People affect every area of life whether it be our family, friends, co-workers, or community. If you want to bring happiness into your life, bring people in that support you and your goals. 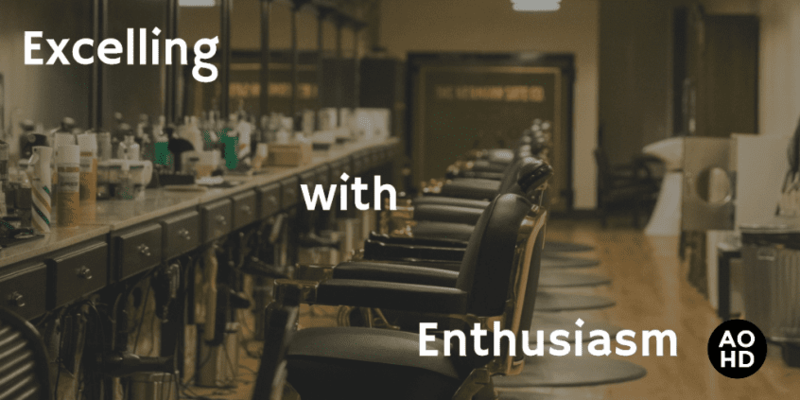 Additionally, in a service industry such as that of beauty and barbering interaction with others makes up an enormous amount of the job itself. Care about your clientele, treat them well, and the rewards will pour in. Dale Carnegie’s breakthrough novel How To Win Friends and Influence People is a great text to add to your library, but a look into the second section of the text will help in daily relationship engagement. He provides six ways to make people like you. 1. Become genuinely interested in people. 2. Smile. 3. Remember that a person’s name is to that person the sweetest and most important sound in any language. 4. Be a good listener. Encourage others to talk about themselves. 5. Talk in terms of the other person’s interest. 6. Make the other person feel important and do it sincerely. Applying these simple strategies is bound to edge improvement into your life. If happiness does come largely from other people, then a person has a great deal of control over how good their lives can be. Life can be a lot. Each day presents new tasks and challenges, often before you even hit your lunch break. But when you make the decision to value the heart of fun in your daily life, you can see the benefits roll in. When you bring the right attitude to each area of your journey to your career, when you approach each task big or small with enthusiasm, when you decide to make the most out of a work day and choose to find the fun in life – that is FELT.